People keep asking what makes Midnight Window Tinting the Best Choice for Window Tinting & Paint Protection in the Pacific Northwest. Well that’s easy! First, we are Washington’s largest window tinting company with three convenient locations. Plus, our installers are all certified in the products we use. To top it off, we are also the Northwest’s leader in pricing and customer service. The choice seams clear! Remember, with film installation, it’s all about the expertise and experience of the installer—and we have more experience than anyone. At Midnight Window Tinting we have performed over 100,000 film installations since 2001, and more than 80% of our customers are referrals or return customers. That says a lot about the quality of our work and our customer service. Our team has a combined experience of close to 100 years. We stand by our work, always. 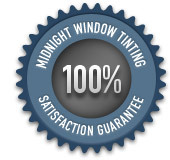 Midnight Window Tinting is so confident in the quality of the products we offer and the installation we provide, that we offer our customers a 100% satisfaction guarantee on our work. If you are not completely satisfied with the job we’ve done, we will do everything in our power to make it right. If you’re still not satisfied, we will refund your money.